In 'The Archies' #2, the band hits the road to their first gig and everything that could go wrong does. It's just par for the course as the kids adjust to traveling together, getting lodging, and learning to adapt when things don't go as planned. Writers Matthew Rosenberg and Alex Segura, artist Joe Eisma, and colorist Matt Herms bring to life the highs and lows of band life with a familiar but amusing chapter. Page one exemplifies the dynamics of the group - Betty working on the stalled motor, Archie at the wheel looking exasperated and breaking the fourth wall, Jughead trying to fend off an angry Reggie, and Veronica scrolling through her cell phone. They're stuck in New Jersey and it's anything but smooth sailing. On the road to a gig in Hollywood, The Archies have some shows lined up along the way and with Daddy Lodge's credit card, Veronica is providing the accommodations. It's one of the perks of having such a privileged member of the band. There's a fun montage of the suite's amenities and the band's awe and joy. Of course, the baller life is short-lived and things begin to go off the rails. The band's trials and tribulations eventually get resolved which comes to no surprise. It's fairly predictable and no obstacle is too big for the kindness of strangers and a whole lot of luck. This is like classic Archie - broad comedy, overly dramatic calamities, and serendipitous conclusions - with a modern sheen and cool band references. This isn't a bad thing, it's all executed well in one big beautiful fun package with lovable characters. Eisma has become one of the best artists to bring modern Archie to life. Their updated designs are hip and full of expressive joy. I don't know if Eisma is responsible for the clothing choices but it's spot on. Everything about the layouts and color choices by Matt Herms is well paced and bright. 'The Archies' is simply good-natured fun that's relatable with broad appeal. It's the characters you know and love presented in lovingly new ways that still make you laugh. This well-worn journey of up-and-coming bands has some surprises along the way with special guest stars from real bands. 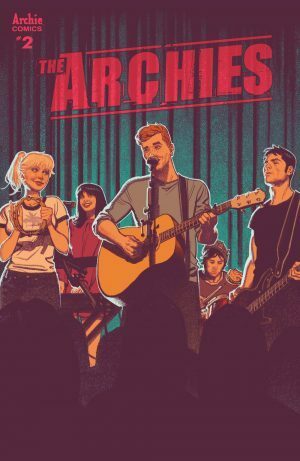 The creative team's love for music and Archie shows making 'The Archies' impossible to dislike.